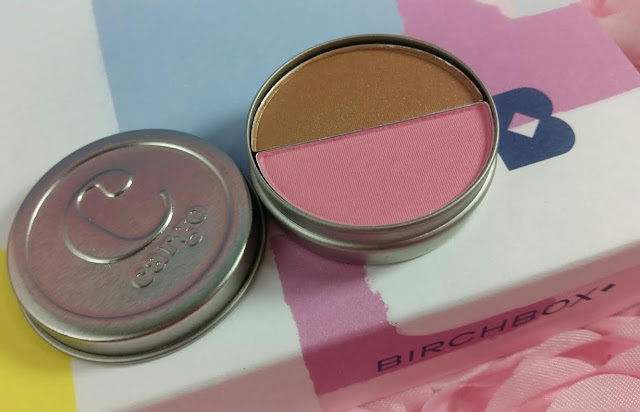 Cargo Blush and Bronzer Duo- This is Catalina/Medium so it's a little much for me. I mean, I'm a ghost during the Fall, Winter and Spring. I get a little tan in the Summer months but not tan enough for "Medium" to not look obvious. Sadly. Also this is tiny. Are you supposed to swirl your brush over both at the same time? Supergoop! Sun Defying Sunscreen Oil with Meadowfoam SPF50- This is a skin-nourishing oil with SPF. I tend to be dry most of the time so a moisturizing sunscreen is definitely a bonus. I've never used an oil, though. This one is antioxidant-rich with meadowfoam and argan oils. I'll try it. I've lots of gardening to do. I'm not using it on my face though. 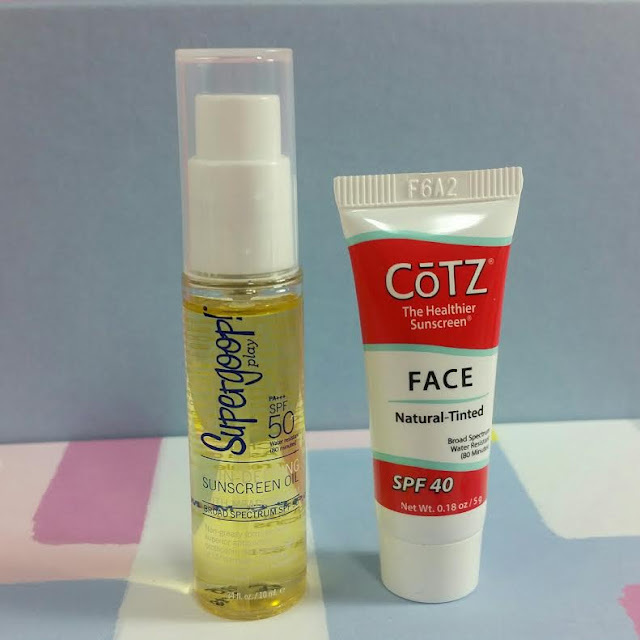 Cotz Face Natural Skin Tone SPF40- I actually really am loving tinted sunscreens. They're basically magic and make me *want* to wear it. Right now, though, I'm hooked on my Hydropeptide Solar Defense version that not only has sunscreen and a tint but functions as a great moisturizer with antioxidants, peptides, hyaluronic acid and aloe. It's like all my favorite things at once. I love it and wear it constantly. So Cotz will have to take a backseat and I'll probably give it to my friend who is a runner AND DOESN'T WEAR SUNSCREEN!! She's not gonna be happy when she's 40, let me tell you. Basically, wear sunscreen. All the time. Your old age will thank you. 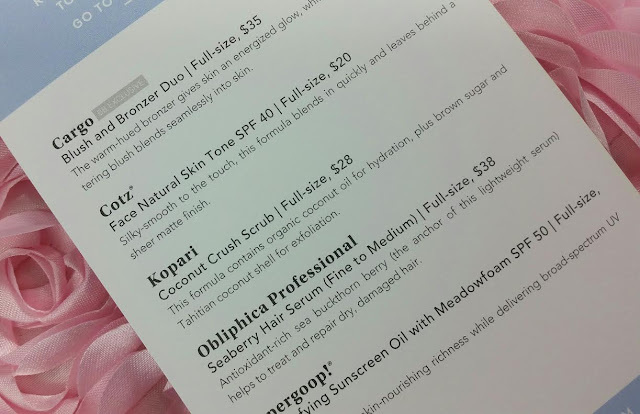 Kopari Coconut Crush Scrub- I'm pretty much down for anything coconut whether its eaten, drunk or slathered. This smells heavenly and it's a very fine grit scrub (it uses coconut shells and brown sugar as exfoliants). I like it! It does use coconut oil which is solid at room temperature so it can be impossible to get out of the tube if it's cold. This could easily be solved by putting it in a jar which, I'm guessing, based on the reviews/complaints, they probably will do shortly. Did I mention how good it smells?! Am I the only one who loves smelling like tanning lotion? Obliphica Professional Seaberry Hair Serum (Fine to Medium)- Looks like this brand is making the rounds! I got the Medium to Coarse hair version in my New Beauty Test Tube. Since I have fine hair, I'll be trying this one instead. It uses the sea buckthorn berry and it's antioxidant rich oil to treat and repair dry, damaged hair. 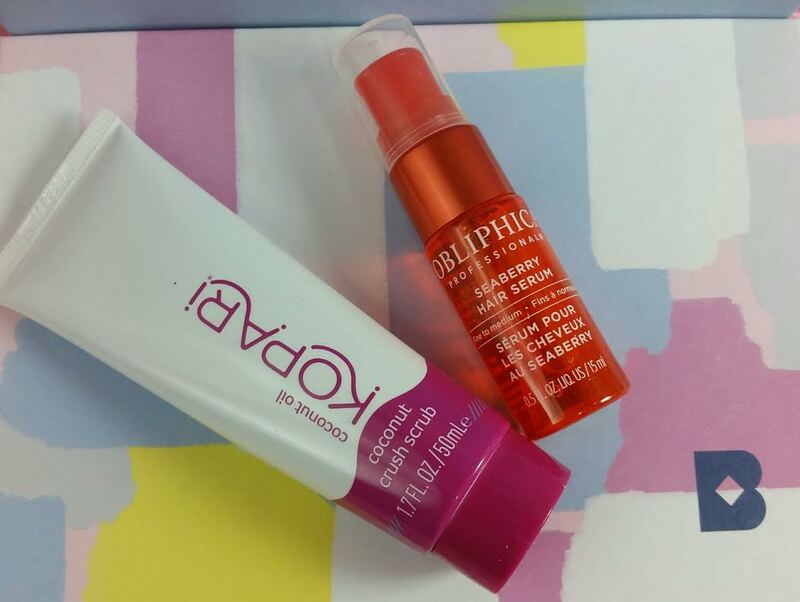 VERDICT: This is a very timely Birchbox. We've had a shocking amount of sun here in Seattle this month. Normally this doesn't happen until July! I spend a lot of time in the garden during the months of April and May and I've been slathering on my sunscreen. I'm happy to have more because it always gets used, no matter what form its in. I still need to try the Seaberry Hair serum and heaven knows my hair needs it. All these dye jobs have frazzled my ends and turned me into a frizz ball. 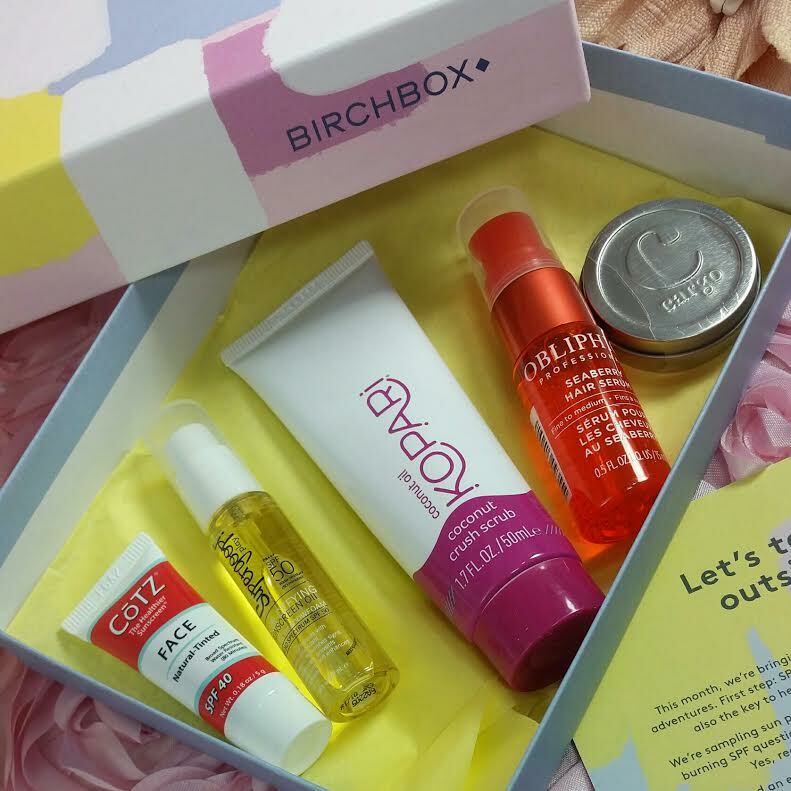 Sign up here to get your own box! Use code SUBSCRIBENOW50 and get 50 Birchbox points added to your account! That's $5 to spend in the Birchbox store. At least I think it's still working. I don't love to eat or drink coconut flavors but I love the coconut / tanning lotion smell!! I chose the Supergood sunscreen oil for my pick this month but haven't tried it yet. WOW, I got the curated box and didn't think it fit my needs well at all, but I almost always play it safe.. Also, YOUR box matches my Birchbox Keds and mine doesn't. Man, I want a box to match my shoes- you know how I am. I love your box ( except Cargo products). I've already bookmarked two full sized products from your review to buy- the COtz sunscreen and the Obliphica Hair Serum, which my hair stylist has recommended to me 3 times now and I never can remember the brand. I am so happy you got what I think is an AMAZING box for a Texan in the sun most of the year... might be a lot different in your area, don't know. Amazon has a GREAT review of the Cotz product showing the girl's arm with a dab of the product, then the bare arm ( she got the photos reversed but you can clearly see this), then her arm with the sunscreen. REALLY pretty glow with the "Natural" color, IMO. I'm so jealous! You got a coconut scrub! I wish I had gotten the sunscreen oil in my box. I think I recall it being a sample choice, but I picked the body peel. Aw, I agree the Cargo is a bit small.